The Jeep Cherokee offers the style, space, and capability that Lafayette drivers look for most in an SUV. With Trail Rated capabilities, a customizable 4×4 system, and up to 29 lb-ft of torque (2019 model), you an conquer Indiana roads with confidence, no matter the weather. So why not get the most for your money? Before stopping into our Crawfordsville showroom, check out our ongoing deals on new, used, and CPO Jeep Cherokee models! Then get in touch to set up an appointment, and drive home with a Jeep Cherokee. 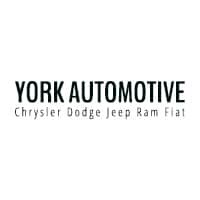 Why Choose York Chrysler Dodge Jeep Ram FIAT? If you’re looking for an unparalleled car-buying experience, do not hesitate to visit us for whatever automotive needs you have!